Sliding doors are an aesthetically pleasing way to bring lots of natural light into a room. They are also a highly efficient way to gain access to an outdoor area. Yet, as wonderful as slider glass doors are, finding sliding door window treatments that don’t detract from their usefulness can be quite a challenge. After all, what good are sliding door window treatments if they limit the amount of sunlight that gets into your room or makes it difficult to actually use the door? Luckily, there are some great window treatment options available. 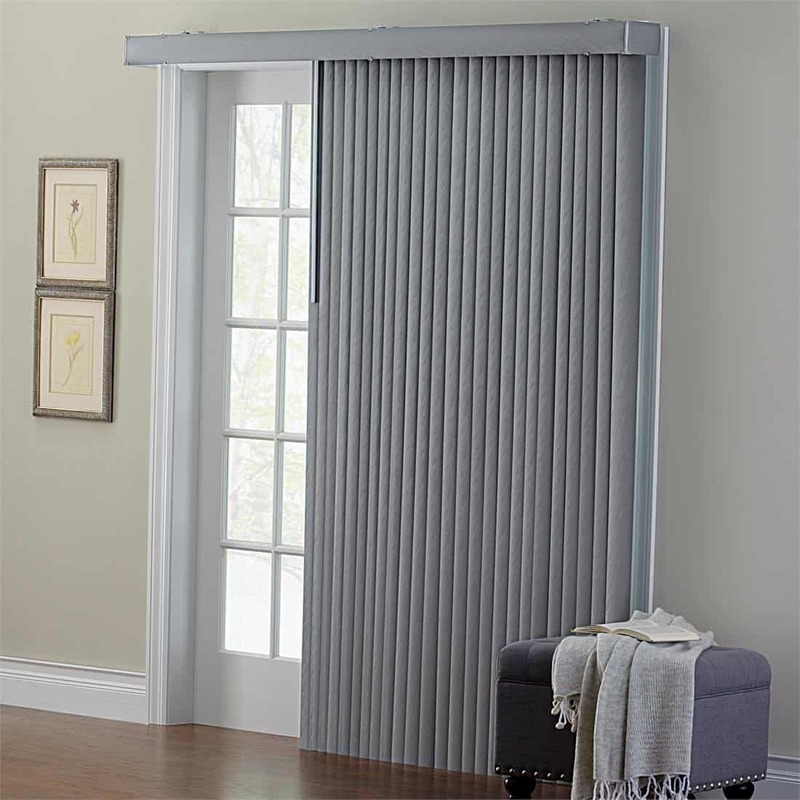 Sliding door blinds are the most common window treatments and provide the best solution for privacy concerns in a home where sliding doors and French doors are used. 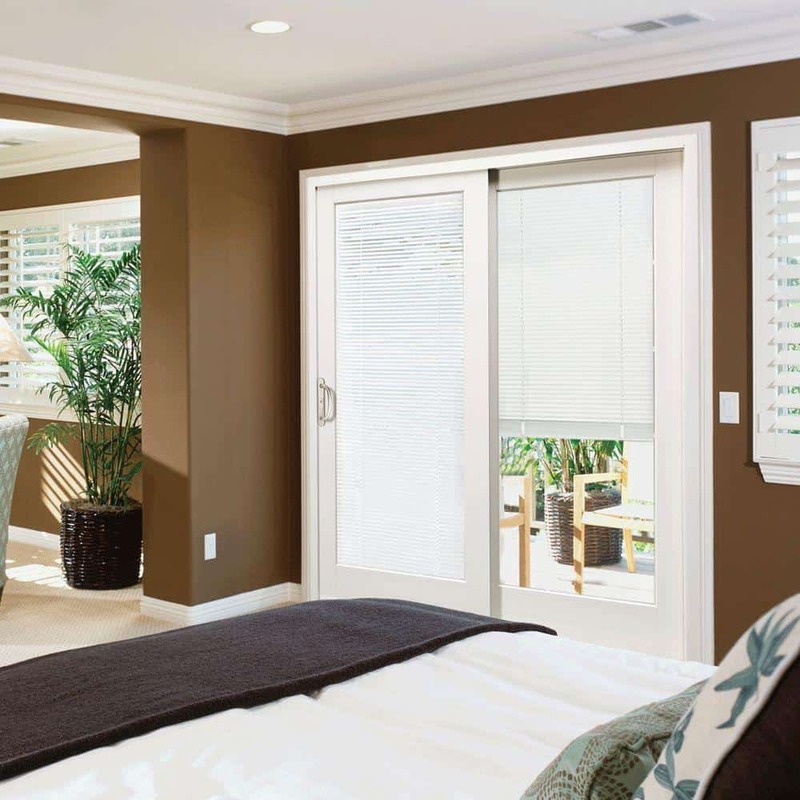 Sliding doors are attractive and efficient, but they need to come with the proper kind of treatment to preserve privacy and filter sunlight. But choosing the wrong kind of sliding glass door blinds can ruin the beauty and efficiency of a sliding door. 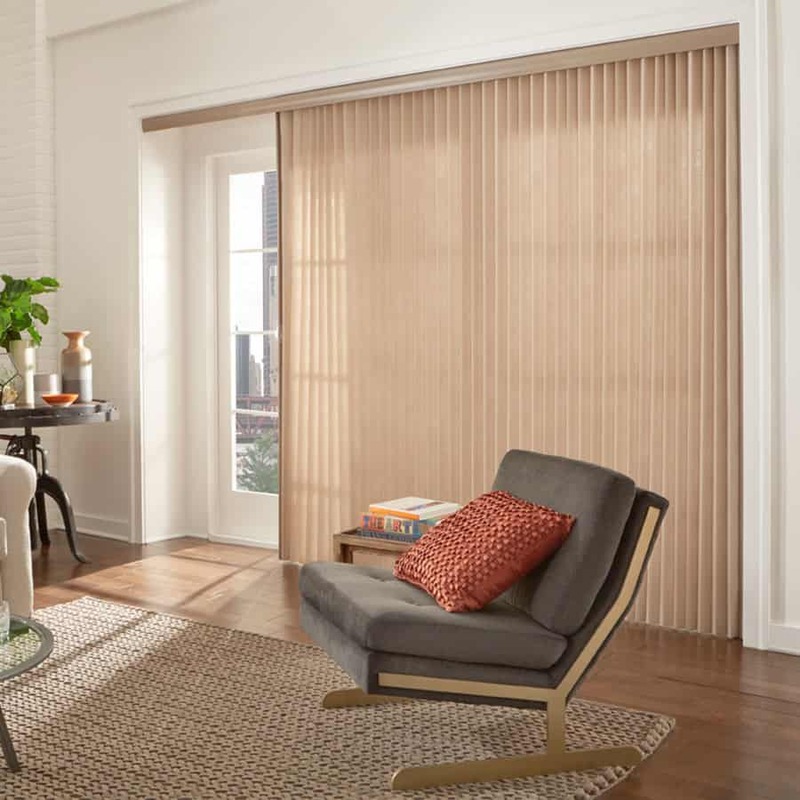 So in order to keep this from happening, you need to know the different choices you have when it comes to sliding door blinds. Sometimes having tons of choices can be overwhelming, but it is a blessing in this case if you know what options you have. 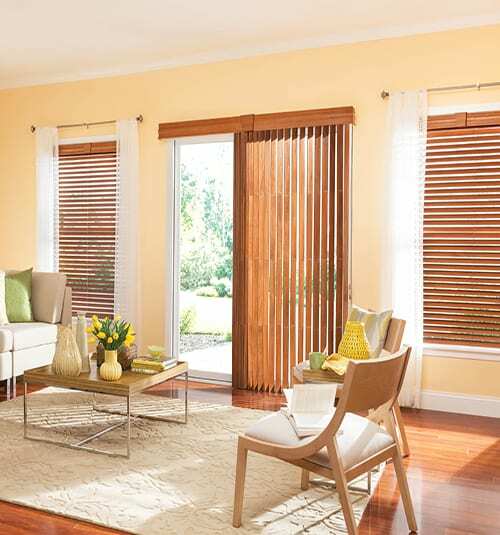 Blinds are commonly made of PVC plastic, Faux Wood, Real, Wood, and Fabric. They are constructed using slats or vanes that can be adjusted using a cord, a wand, or a remote control. 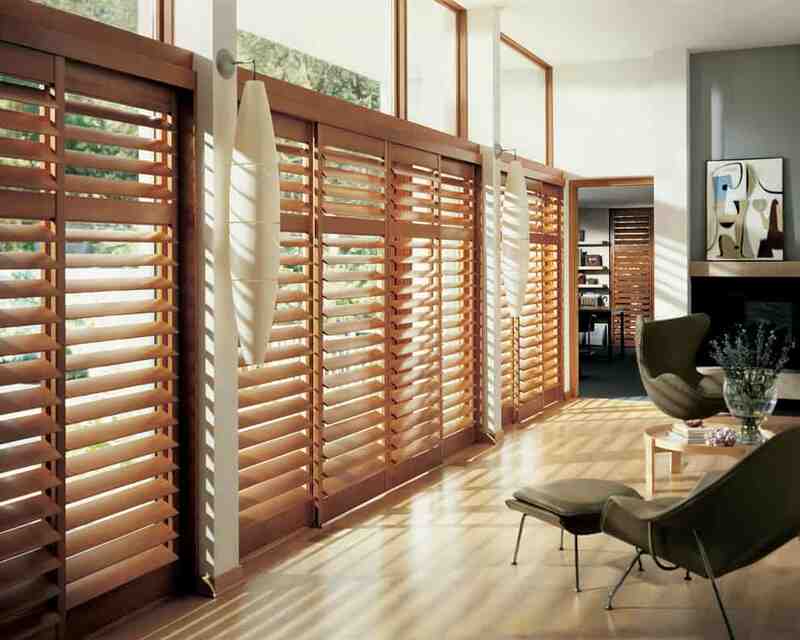 Their slats slightly overlap, making the blinds and shades very easily adjustable. Because they are easily adjustable, sliding glass door blinds can provide privacy whenever you want it. You can also control the amount of light that can get in your home. They lie flat against the sliding doors in the closed position. And in the open position, they can be arranged to let in as much or as little light as you desire. Plus, when the slats are drawn completely open, they fit neatly against each other out of the way of your indoors to outdoors travels. 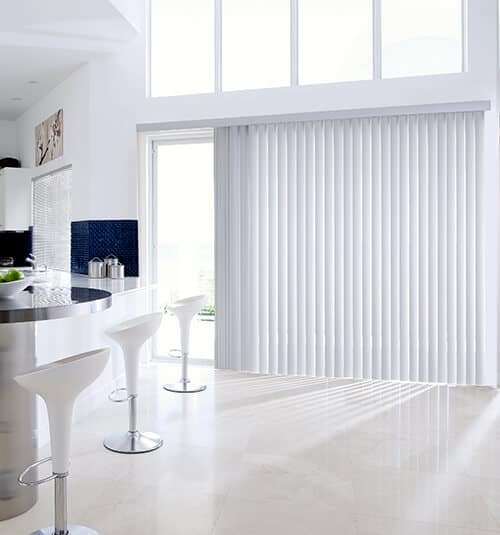 When it comes to sliding door blinds, the most important decision you need to make is choosing the size of the slats. They come in 1-inch, 2-inch, and 3.5-inch sizes. 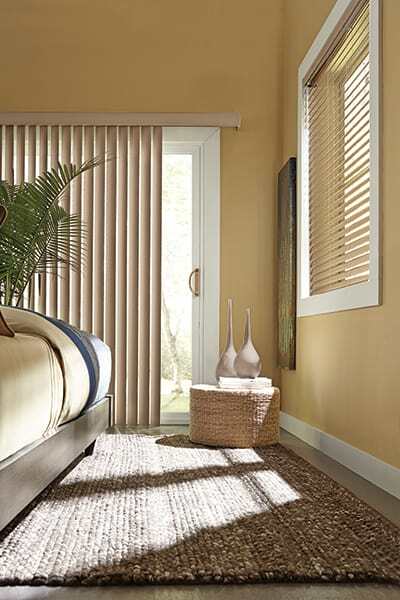 Most homeowners choose 3.5-inch slats because it gives a modern look. Those who prefer treatments that require less maintenance and are cheaper should choose 1-inch slats. If you want to maintain an old-fashioned theme in your home, 2-inch slats should be your choice. 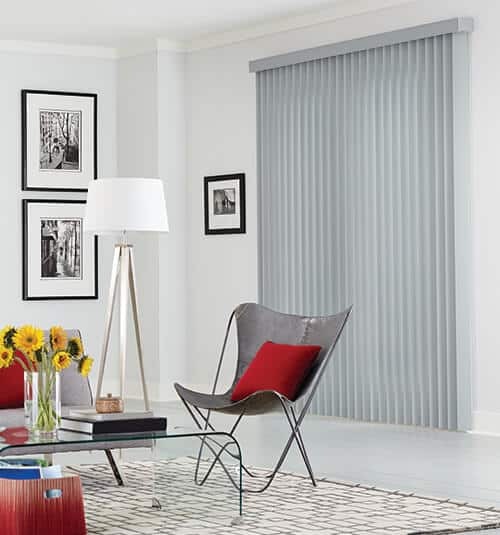 Sliding door blinds come in a wide variety of colors and materials. If you are going to change the color scheme of your room, it is best to choose a neutral color sliding door blind. But, if you want your sliding glass door blinds to look prominent, pick a color that will stand out against the wall or your door. Pro tip: Most interior designers avoid using blinds and curtains as the basis of a room’s color palette. Let the room color and decor determine your blind color. Vertical blinds or shades are the most popular choice because they offer total control of the light allowed into the room and they are cheap. They are easy to install and maintain and are perfect for sliding doors. Plus there are lots of blind styles available. Because of the many problems people have with vertical blinds (they break, get dirty, they make noise, most are ugly), you can now buy specialty sliding glass patio doors that have horizontal blinds built-in. The horizontal blinds are sandwiched between two pieces of glass and controlled by a slider knob. 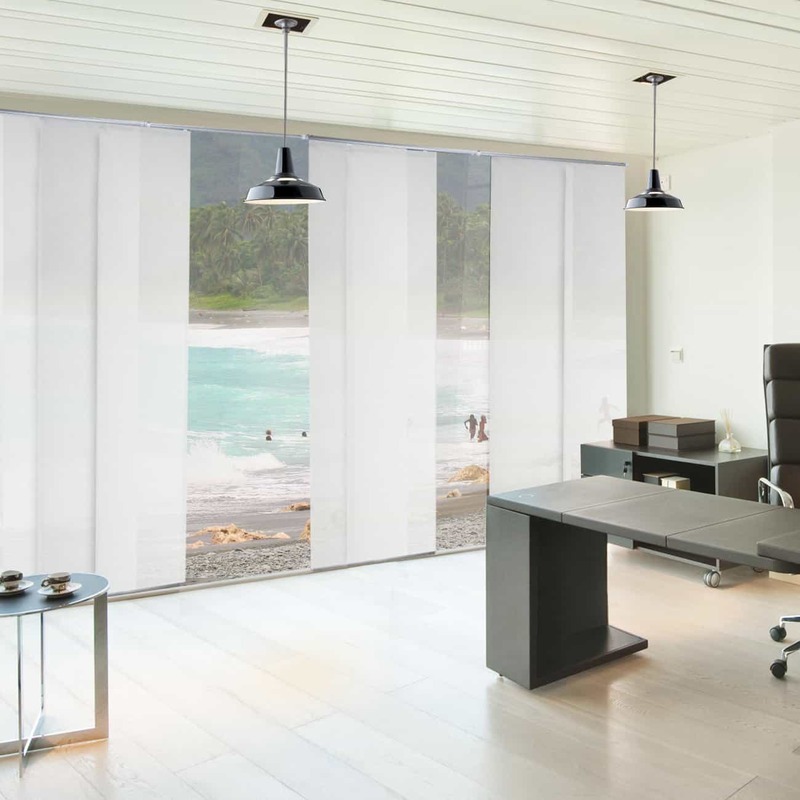 These ingenious sliding glass door blinds are impervious to dust and dirt, they look great, and they open and close at the flick of a switch. 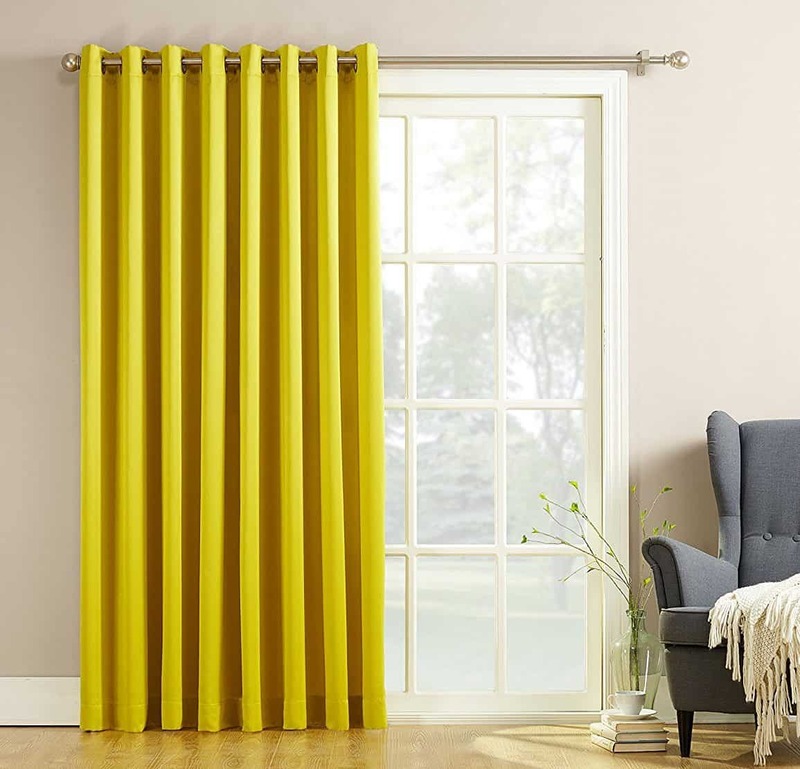 The quickest and easiest choice for sliding patio door window treatments is curtains. They can add style and drama to your room while providing light control and easy access to the door. Curtains come in many fabrics, colors, patterns, designs, and motifs. Sliding glass door curtains should be able to be tucked away to prevent people tripping over them when passing through the doorway. So be sure to choose one made of a material that is easily stored away behind a tie or sash. A glass door is often an important source of light, so also consider using a translucent material which will allow light into the room and maintain your privacy. 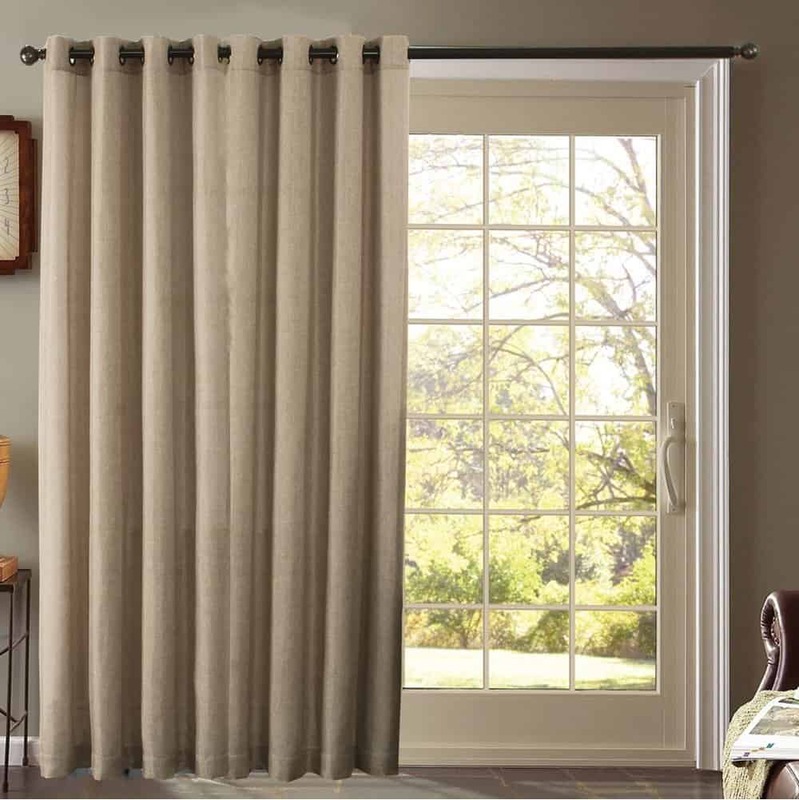 Light colors, such as grays, creams, and light blues are ideal for translucent curtains. 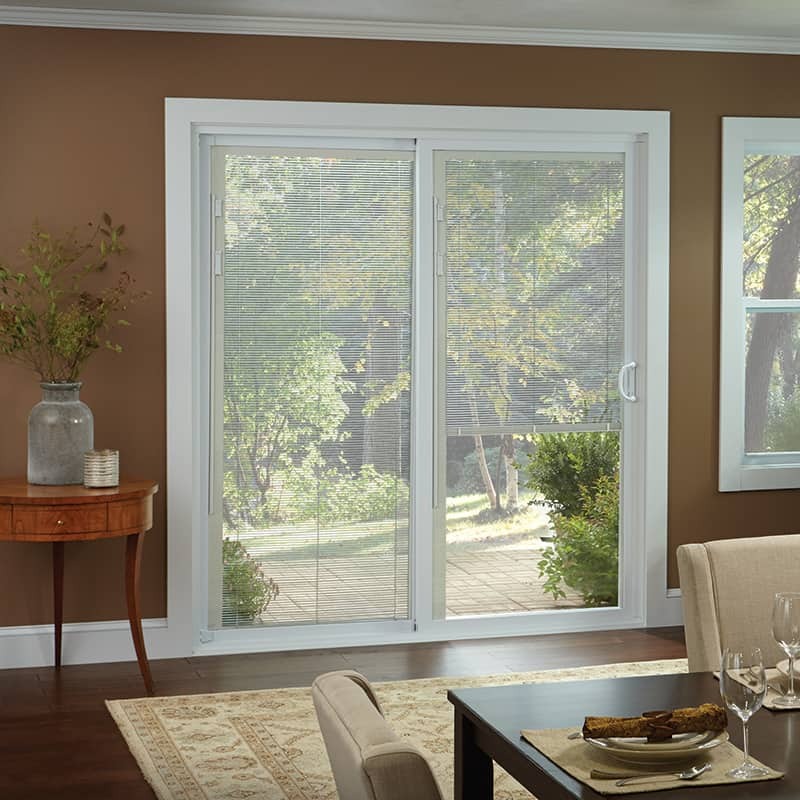 If you like to leave your sliding glass door open to let a breeze enter the house, then choose a lighter material. In this case, I prefer simple designs rather than overly decorated and intricate ones. They are really easy to install too. With a quick DIY installation of a sturdy curtain rod, you can have your curtains up and brightening your room in less than an hour. You can even dress up the curtains with a coordinating decorative valance that sits over the main curtain rod. Pro tip: Check the weight of your curtain. Use a strong and secure curtain rail so that the curtain does not fall and break the glass. Curtains for sliding glass doors can make a beautiful addition to your house, and also improve its safety for children and adults alike. Sliding panels are another good choice for sliding patio doors. The panels operate on a track, so their workability with large areas of glass work perfectly for sliding glass doors. 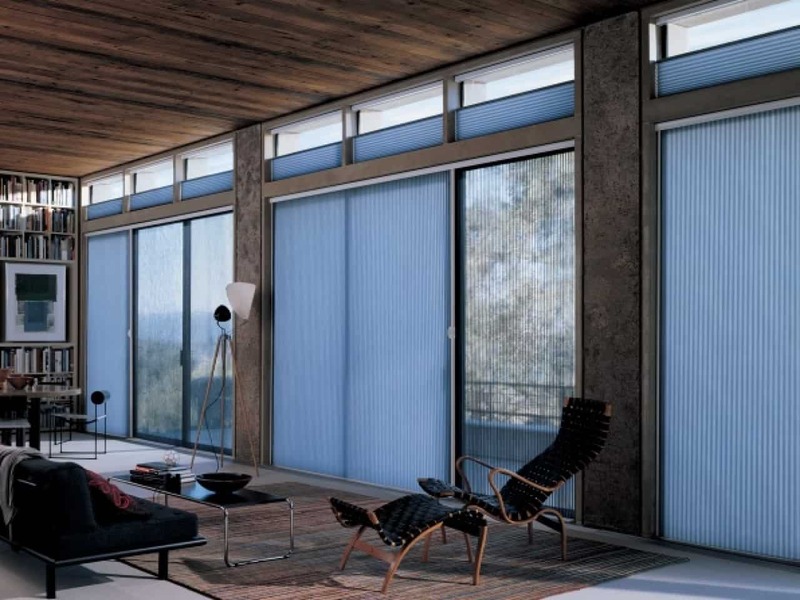 Cellular shades are a relatively recent product option. They can be transparent or opaque and they are designed as wide vertical pleats, forming an accordion-like shade. 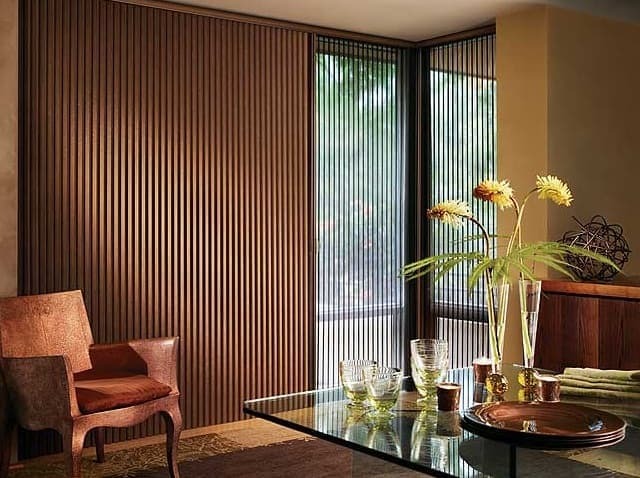 Vertical cellular shades are great for energy efficiency in rooms with large amounts of glass. They can be pulled open or closed, or gathered in the middle, as you see fit. The best part is that all these types of sliding glass door blinds are available in a wide variety of fabrics, colors, and materials. 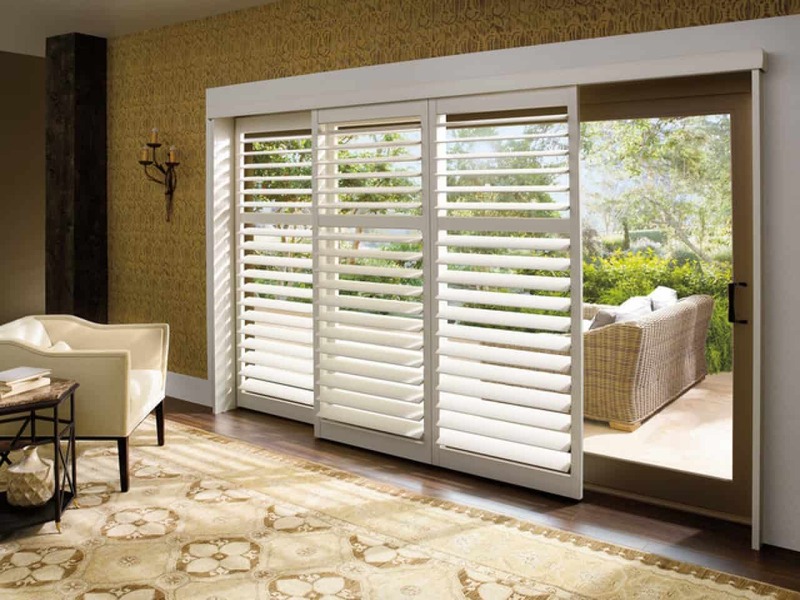 Another popular and quite stylish option for sliding glass doors is plantation shutters. With a track much like that of the sliding doors, there are some types of shutters slide open and closed. Others have hinges enabling them to slide open and shut. 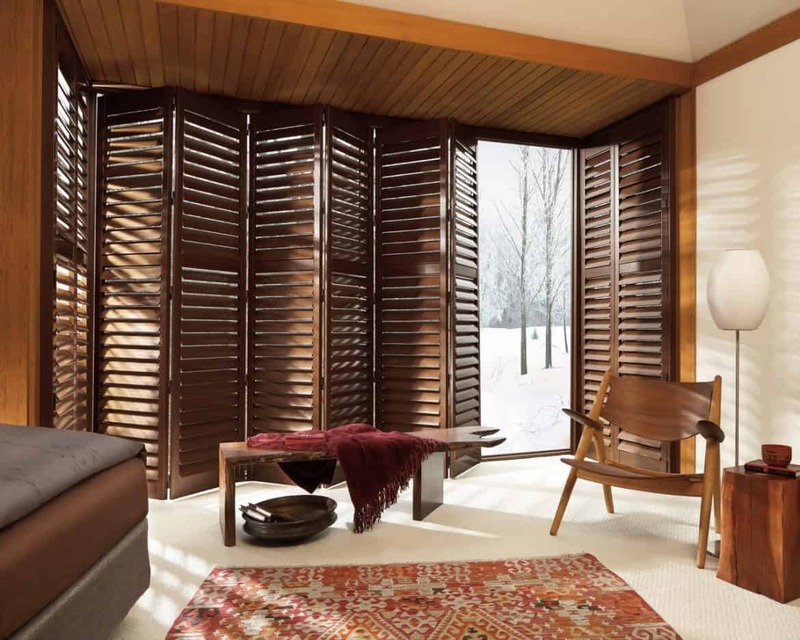 For light control, plantation shutters can come with wide or narrow louvers at your request. They rotate from closed to open to allow in as much light as you wish. If you’re considering Plantation Shutters, be sure to check out this nice walk-through video. Read this Before you Buy Window Treatments! When choosing window treatments, there are several vital considerations that will help determine the sliding door window treatments that are best for your room and will fit in with the overall feel of your home. 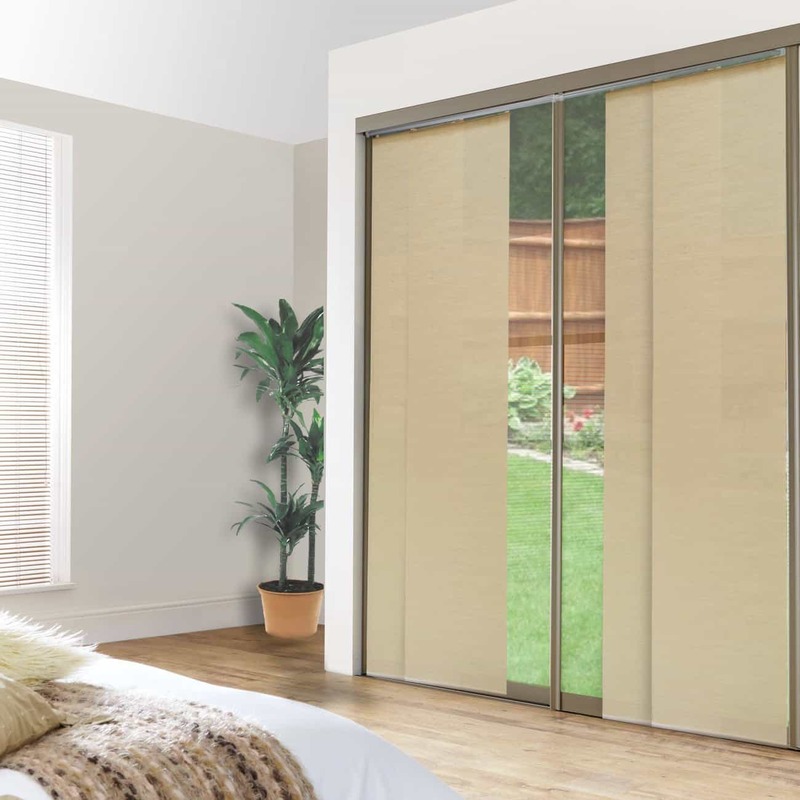 The benefits of slider doors make choosing the perfect window treatment for sliding doors a potentially tricky process. 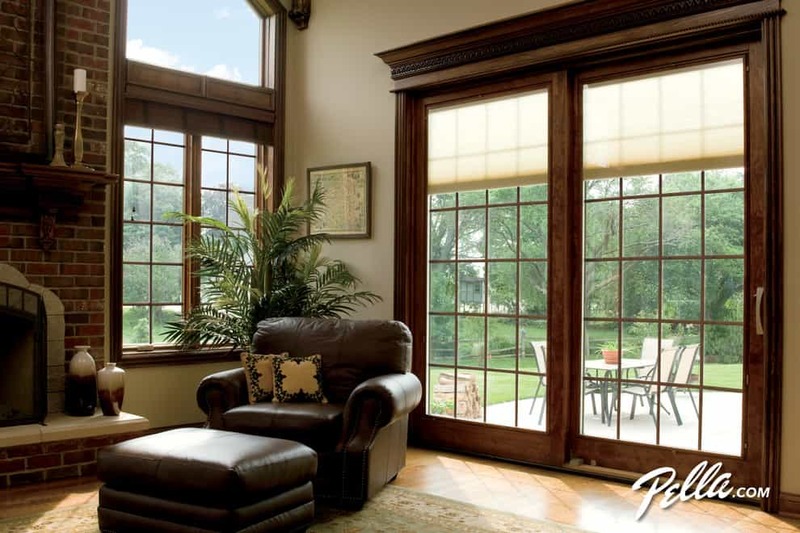 Here are some tips to remember to help you choose the right window treatment for your sliding glass door. First, if your sliding glass patio doors are in the same room with other windows, then be sure to coordinate your window treatments. It will look best if all your window treatment match. Next, I always recommend that your window treatments operate in the same direction as your sliding glass doors. Meaning that if your door opens from left to right, then your curtains should also open that way. This obviously depends on the type of treatment you choose and rules are meant to be broken. The last tip, sliding glass doors are usually highly traveled areas. So you’ll want choose window treatments that will stand up over time. Don’t buy some cheap hanging plastic blinds, they easily crack and break with daily use of the sliding doors. 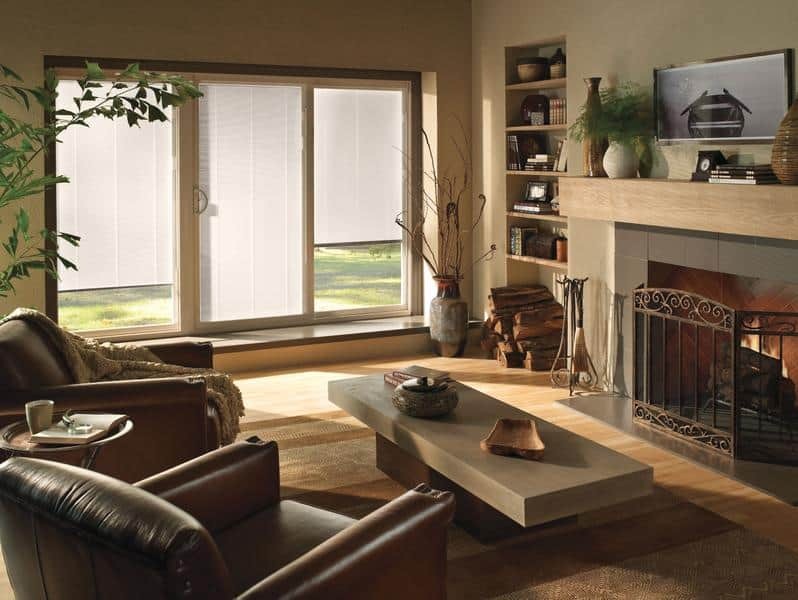 You’ll want window treatments that preserve your ability to control natural light. Really, what good is the wide openness of sliding doors if your treatments hinder the light’s ability to fill your room with its warmth? Access to the outside is another factor. 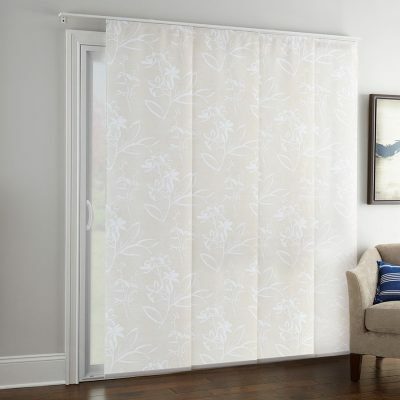 You don’t want to hinder the easy working of the sliding door with cumbersome window treatments that make it more difficult to access your outside area. Lastly, consider that sliding doors often provide a lovely view of the yard or deck, so it’s important to choose something that won’t block your view, but still allow you the option to have some privacy on those occasions when you wish to have it. With options like curtains, blinds, shades, shutters, cellular shades, specialty treatments, your choices of window treatments are as fluid as your lovely sliding glass doors! Now that you’re armed with all of this quality information, you will definitely be able to find a window treatment for your sliding door that fits your needs, style, and budget. I’ll be honest, and maybe you could tell, I’m not a fan of vertical blinds. It was really hard to find modern stylish options. Blinds used to be the way to go if you were on a budget, but you can get much nicer looking curtains for cheap as well. But if you if you have a large budget, I love the look of plantation shutters, they simply look amazing. I love plantation shutters too but they tend to block part of the view when opened. Our new home has a zero corner sliding door so that two walls open completely up to the outside area. I don’t like verticals either, I think they look too officey but I wondered if you knew of any company that is making nicer vertical blinds these days. This is great work you did here. Very useful, thank you. 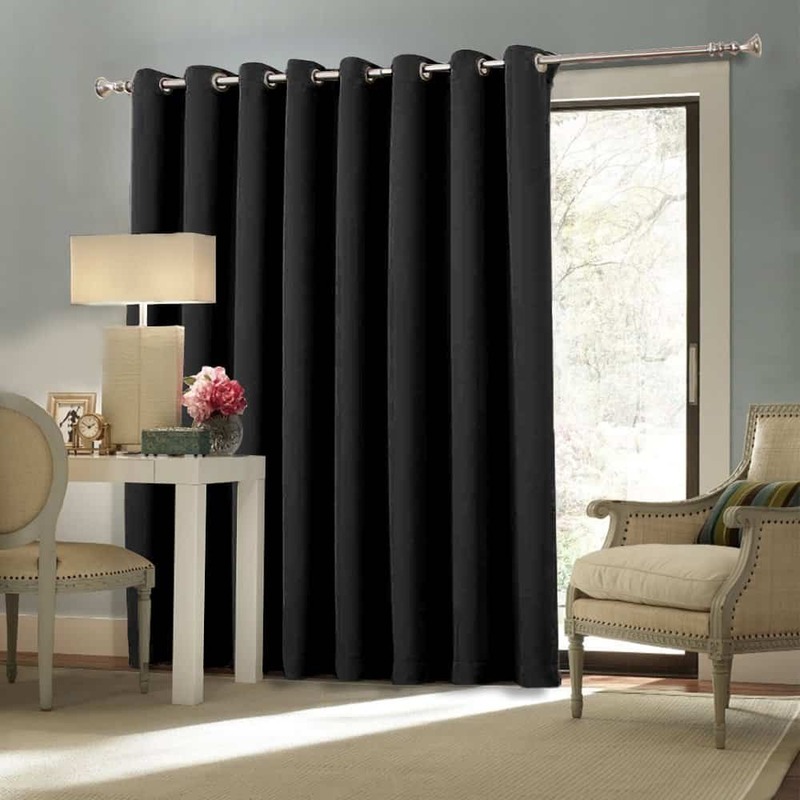 Really great information about window Treatments, blinds, shutters, and curtain. Thanks for posting Blake Lockwood. 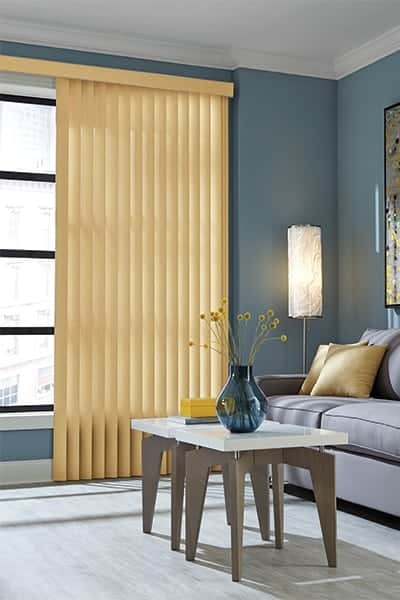 Vertical blinds are great for sliding doors because they stack tightly to the side. You did a nice work by posting this. I appreciate it and enjoy reading your posts. Thanks. I’m in the process of building a new house and this was super helpful as I try to evaluate all my options, since I’ll need all new window treatments and I have several sliding glass doors we’re putting in. I like the idea of having shaded to be able to protect the home. I would like to have the sun blocked out. I think it would be nice to have all the shade possible. Thanks for suggesting finding a window treatment that will last over time. My husband and I are redecorating our living room, and one of the big features is a sliding glass door. We’ll remember what you said as we look for the perfect window treatment. yes, the would go on the inside. The rod above the door should keep them a few inches from the glass. Thanks for posting the options here. I currently have some sliding panels for our 3 panel sliding glass door to the back. They are kind of cheap and falling apart and were an Ikea special according to the previous owners. When taking them down to paint, the room became so much lighter and more emphasized space. I may leave it open without treatments since I cannot stand vertical blinds and curtains would probably darken the North facing patio covered glass panels. I was intrigued by the vertical cellular shades however. Do they stand up to high traffic areas well and how well do they push back to open in general? Thanks! I love that you are a decor snob! I enjoyed your overview of patio door window treatment options. Im usually a traditional drapery fan, but after a recent move to a midrise condo overlooking a wooded preserve, have come to realize that draperies will not preserve the view nor provide flexibility for sunlight control, as they are either open or closed. From a practical standpoint verticals do offer the ability to regulate light and privacy while still allowing the view we love. Our taste runs to a traditional refined but not fussy collected look – what to do!? Please give your opinion about the newer curved verticals that can emulate (somewhat) the look of drapes We’re in a quandary Thanks! Great info. I am in a good place in my life, emptynester, single in my 50’s with a good income and am in the process of redecorating my townhouse…My color pallet is griege and dark grey and I need window treatments for my patio doors and am considering sliding glass door curtains as I ve grown tired of blinds. I have a center slider door with stationary glass on both sides. 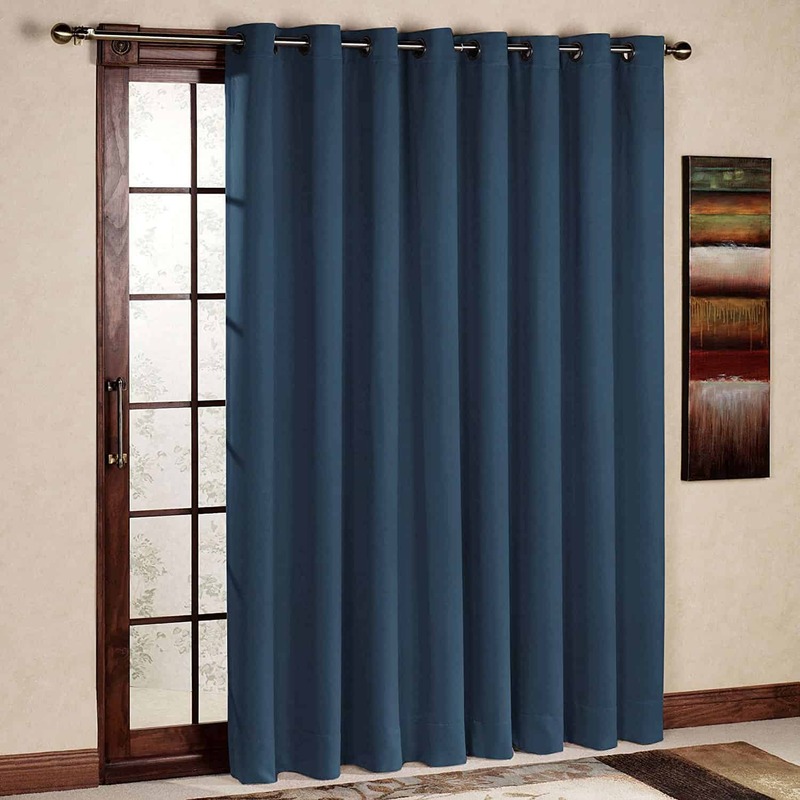 I want to add grommet top curtains to both sides which measure 38″ each and place grommet top sheers for the actual slider door to make it easier to pull them to the side when opening the center door. I’m having such a difficult time deciding on what size grommet top curtains for each side. I have a regular standard sliding glass door In my new apartment in my living room. It is the only window in the open space as it is beautiful but small and all open into the kitchen with new hardwood floors throughout the apartment in that reddish brown hardwood color. Anyway I have decided on the type of drapery I want around the stationary sliding door as it will not be used for going inside and out as there is a faux balcony and the railing is only a couple of i inches away from the door on the 2nd floor so it is not a door that is used to go in and out of just to open only to get some air in the spring with the screen attached of course as well when you open the door. Anyway I chose beautiful cream color draperies on a pole with dark rought iron fineals holding them up above the door and the dark color pole will be spread out on both ends of the door. Also it is average size door with average 8 ft ceilings too above the door. But I’m torn between the kind of window covering I want for the sliding door? I like a very custom look like a model home and since I’m putting the side cream color drapes around the door with the dark rought iron pole and finials I’m torn between using a Roman shade or honeycomb shade to cover the glass part of the door? I always love Roman shades but they are alot more expensive for 1 wide one to cover the double glass door. They honeycomb shade looks nice as well with the cream color drapes around it but since this door is the only window in the room when you walk in i want it to stand out but also not to be so overdone as it is a small room but it is all open. Would you do the Roman shade or the honeycomb shade on the sliding glass door with the formal cream color drapes around them? I just want that very custom look and I’m very picky!